My son has autism, so my daughter, his twin sister, gets a little anxious when she is having a new friend over for the first time. She was in second grade the first time it happened, about five years ago. On the walk to school one morning, she asked me if we could explain autism to her new friend Stella, who was coming over after school. I asked her what it was that she was so worried about. She said she was worried about not knowing how a new friend might react to meeting her brother. What will she think? Does she know what autism is? I told her a lot of the questions could be answered by having a conversation first. She asked me if I could be the one to do the talking. As I could see the little tears forming in the corners of her big, blue eyes, I felt sad for her — sad that this was weighing so heavily on her second-grade mind. I was proud of her for being honest with me. I let her know that I would start the conversation, but that she could feel free to add anything at any time. When my daughter and her friend arrived after school, I offered them a snack. We sat down at the table and talked a little bit about their day. Then it was time for me to shift the conversation. I put my own emotions aside and let the words flow out. No tears, no shaky voice — just doing my best to make the girls feel comfortable. She said no. I explained to her that this means someone’s brain works differently than a typical person, even if both are the same age. “People with autism could have very different interests and do things that might make others curious,” I said. Then I introduced her to my son. I asked him to say hello to her, and he did! And she said hello back. I think it was helpful to be able to put a face to the name. I let her know that he does not talk that much, but he does understand everything we all say. And that she may hear him talking to himself. “What kinds of things does he say?” she asked. “He usually repeats lines from TV shows and movies that he really likes,” I said. I also informed her that he could get a little loud if things weren’t going his way, but that I am always right there to help him. As I was speaking to her, she seemed interested and receptive to the conversation, which was a relief. I made sure she felt comfortable and then let her go on with the playdate. As Stella started coming over more often, she became a familiar person to my son. She began to initiate the hello to him and he started to return it on his own, without me prompting him. He eventually even remembered and used her name! As new friends become more regular in our home, his autism becomes less and less relevant. Some stress even lifted from my daughter. 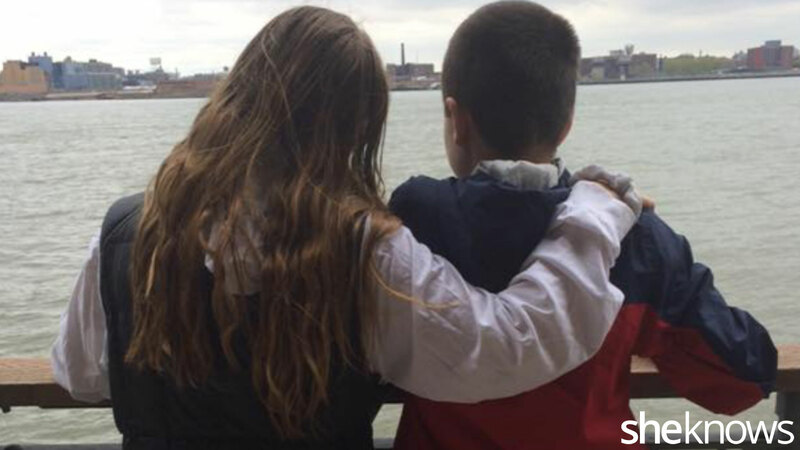 Having a sibling with special needs is an enormous task, and it’s never easy. My daughter struggles with this on a daily basis. I would say that these struggles began when she realized that her sibling was very different from a lot of her friends’ siblings, that things were different at other people’s houses. She is in a position that none of her friends can really relate to. I mourn the fact that they will never have a typical sibling relationship. I know she loves her brother — I hear her say it to him — but I also know that she gets embarrassed by him at times. She worries about whether or not he is going to be too loud, get upset, talk to himself or be impatient. I cherish the times they are sitting on the couch next to each other, or when we are walking outside and they are holding hands, or at bedtime when I always hear her say good night to him. I always welcome information from other parents about how they deal with situations. As special-needs parents, we are all on this different journey. Having one typical child and one with special needs puts us on two different paths that we must figure out how to get down. I truly believe that we as parents are each other’s best resources. Being open with my daughter’s friends has been an approach that has worked for us. The children have all been wonderfully receptive to the conversations. We have never had a friend who did not want to come back.